Lebron James has been very impressive in his debut season, especially considering he's only 18 years old. 6' 8" 240 lbs?! 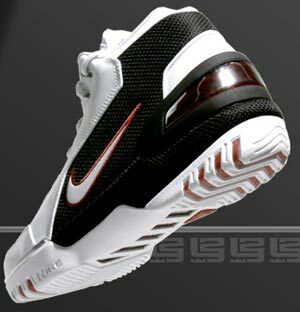 His new Nike shoe, though, is surprisingly old school and low-key in its design. 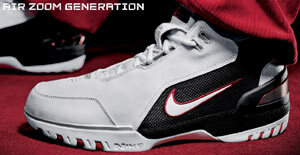 Compared with all the other basketball shoes Nike has cranked out the last few years, it almost qualifies as retro. I don't mind retro looks, but the James' shoe's simple and understated design may dampen its sales with basketball youths.